Rare presentation of femur fracture during Cesarian section. Department of Surgery and Surgical Specialties, Faculty of Medicine and Biomedical Sciences, University of Yaoundé I, Cameroon. Introduction: The practice of cesarean section is known to decrease the occurrence of long bone fractures. We present here an unusual diaphyseal fracture of the femur of a newborn after cesarean section, the only case observed in our 14 years of practice. Case Report: The patient was a 3.4-kg female child born at 38 weeks of gestation. The mother was a primipara and aged 39 years. Ultrasound examination at 20th week revealed intrauterine fibroids with a breech presentation. Therefore, elective cesarean section was indicated. There was no apparent bone disorder that could predispose to sustain femur fracture. The fracture was treated successfully with a bilateral spica cast. The cesarean section was indicated in an aged primipara, bearer of uterine fibroids, and breech presentation. She had a good general health status, but her bone density was unknown since this examination is not routinely performed in our clinical settings in Africa. Conclusion: Elderly age, primipara status, presence of uterine fibroids, and breech presentation are usual indications for cesarean section. However, there are not many reports on femur fracture after cesarean section. Our present case suggests that despite the latest advances in delivery techniques, cesarean section for breech presentation predisposes the neonate to femoral fractures. Keywords: Femur fracture; Cesarean section; Fibroid; Breech presentation; Africa. Cesarean delivery is designed to reduce the risks of mother and infant birth-related injuries in the newborn in women with a variety of health complications . Jain et al  observed that the increase in cesarean section rate from 24.2% to 35.3% in a recent study in New Jersey from 1997 to 2005 led to a notable decrease in newborn injuries from 4.1% to 2.6% at the same time. However, there are few reports of long bone fractures that occurred during cesareans conducted to paradoxically avoid such complications. The hypotheses of risk factors for occurrence of such fractures remain conflicting. Matsubara et al. correlated the occurrence of long bone fractures to only higher birth weight. Nadas et al. reported the correlation between occurrence of bone fractures and cesarean section breech delivery with assistance and low birth weight. 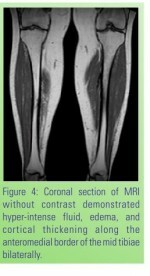 The present study reports the first case of cesarean-related femur injury in a neonate in our orthopedic clinics since 14 years of our clinical practice. Our goal is to feed the debate on the risks of fractures associated with cesareans. We also conducted a review of literature which reveals that certain complications in the mother predispose neonates to femur fractures by cesarean. Capobianco et al  argue that even if the cesarean helps reduce the risk of occurrence of traumatic injury compared to vaginal delivery particularly if there is an association of breech presentation, it does not completely exclude the occurrence of an unexpected complication such as fracture of the femur. Toker et al  stated that cesarean section is the cause of increased risks of occurrence of femur fractures. This study taught us that women presenting a fibroid uterus with breech are at a cumulative high risk of delivering a baby with a fractured femur if they deliver by cesarean. The mother was a 39 years old primipara who attended regularly the antenatal care clinics. The pregnancy lasted for 38 weeks. Ultrasound examination at 20th weeks revealed intrauterine fibroids with a breech presentation. No cephalic version was attempted to correct the malpresentation. Therefore, elective cesarean section was indicated. The gynecologist performed cesarean section and then myomectomy. The breech was not deeply engaged in the pelvis. Therefore the extraction was simple in a sufficiently relaxed uterus. The child weighed 3.4 kg and had a size of 54 cm at birth. All the resected uterine fibroids had a total weight of 2 kg. The child did not require resuscitation, but presented functional impairment of the left leg. Radiographic examination revealed a diaphyseal fracture of the femur localized in the middle third. A non-specialist immobilized the limb in a makeshift bandage (Fig 1) to relieve pain during plain X-ray examination and to facilitate the transportation of the baby to the Referral Hospital. At arrival, we replaced this temporary contention with a bilateral spica cast for 4 weeks. The subsequent radiographic examinations performed after removal of the spica cast showed good consolidation of the fracture (Figs 2 and 3). A number of factors predispose the mother and child to morbidity and mortality; hence, gynecologists prefer less risky or less traumatic delivery by cesarean section instead of normal vaginal delivery (Table I). Primiparity, the advanced age of the mother, the breech, the weight and size of the child at birth, and obstetric maneuvers are indeed risk factors implicated in predisposing the occurrence of birth trauma. Nadas and Reinberg  reported the most common risk factors as obstetric maneuvers (75%), cesarean section (35%), prolonged labor (33%), and prematurity (25%). A recent study carried out by Puza et al  showed that the increase in cesarean section of 4% lead to a significant decrease in the rate of major birth trauma. Here, we present a mid-third diaphyseal fracture of the femur treated successfully by casting in a child born after a normal pregnancy by elective cesarean section for breech and fibroid uterus. The mother was an elderly primipara. This rare addition to the existing risk factors for maternal and fetal health led the gynecologist to take precaution and plan cesarean section to avoid the known obstetric complications of pregnant fibroid: prolonged labor, uterine rupture or fetal distress or obstetrical maneuvers at risk for assisted breech . The present case report fosters the debate of risk assessments regarding delivery options for women with intrauterine fibroids when breech presentation becomes inevitable. Birth trauma has an estimated incidence of 0.13 to 1 per 1000 births [10, 11]. 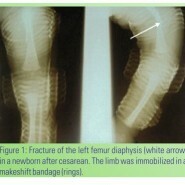 The fracture of the femur of the newborn after cesarean is not common. The first report on a femoral fracture during cesarean section was published by Eherenfest . Toker et al. recently reported one of the largest known series of 12 femur fractures in Israel after cesarean section (incidence of 0.308 per 1000 CS) versus 5 fractures in vaginal delivery (incidence of 0.027 per 1000 VD) in the same series and stated that cesarean section markedly increase the risk of long bone fractures. They also reported a typical case of femur fracture after cesarean section indicated for footling breech presentation, which was treated satisfactorily without sequelae after 2 months of follow-up. They suggested that the risks of cesarean-related femur fracture in the newborn should not be underestimated. Various reports have suggested that the prevalence of fibroids in pregnancy is increasing, 0.865% reported by Noor  and 3–10% reported by Straub et al. . Zaima and Ash  attributed this phenomenon to the tendency of delayed childbearing, rising rate of obesity, and occurrence of pregnancy after fibroid treatment. The prevalence of fibroids in non-pregnant Black women is at least 40% compared to 15% in White women. A local Cameroonian report by Tchente et al  stated that uterine fibroids are the most common benign tumor seen in women at the reproductive age. The cesarean section is indicated in 40% of women with fibroid pregnancy compared to 13.8% in women without fibroid pregnancy. We believe that the same pressure on the urinary organs leading to urinary complications, as reported by Zaima and Ash , could affect the fetus limbs and then predispose to their fragility. The large weight (2 kg) of the total fibroids removed from the mother supports this hypothesis. However, the present case findings and the previous reports confirm that the cesarean section for breech and primiparity and advanced age of the mother to a lesser degree remain predisposing factors for the fracture of the femur of a newborn. Our findings also show that these fractures fully consolidate when treated conservatively. This case report shows that the risks of femur fractures caused by cesareans in pregnant fibroids should not be underestimated, especially in women presenting with large intrauterine fibroids. These mothers should be informed of the risks of injuries before delivery, and the practitioners should ensure that all precautions are taken to prevent bone trauma during the maneuvers. We want to express our thanks to Dr. André Calvin Obstetrician and Gynecologist for his very decisive contribution to this work. 1. Awari BH, Al-Habdan I, Sadat-Ali M, Al-Mulhim A. Birth associated trauma. Saudi Med J 2003;24(6):672-4. 2. Jain NJ, Kruse LK, Demissie K, et al. Impact of mode of delivery on neonatal complications: trends between 1997 and 2005. J Matern Fetal Neonatal Med 2009;22:491-500. 3. Matsubara S, Izumi A, Nagai T, et al. Femur fracture during abdominal breech delivery. Arch Gynecol Obstet 2008;278:195-7. Epub 2008 Apr 22. 4. Nadas S, Gudinchet F, Capasso P, Reinberg O. Predisposing factors in obstetrical fractures. Skeletal Radiol 1993;22:195-8. 5. Capobianco G, Virdis G, Lisai P, et al. Cesarean section and right femur fracture : a rare but possible complication for breech presentation. Casa Rep Obstet Gynecol 2013; 2013:613709. doi: 10.1155/2013/613709. Epub 2013 Mar 6. 6 Toker A, Perry H, Cohen E, et al. Cesarean section and the risk of fractured femur. IMAJ 2009;11:416-8. 7. Nadas S, Reinberg O. Obstetric fractures. Surgery 1992;2:165-8. 8. Puza S, Roth N, Macones GA, et al. Does cesarean section decrease the incidence of major birth trauma? J Perinatol 1998;18:9-12. 9. Noor S, Fawwad A, Sultana R, et al. A pregnancy with fibroids and its obstetric complication. J Ayub Med Coll Abbottabad 2009;21:37-40. 10. Morris S, Cassidy N, Stephens M, et al. Birth-associated femoral fractures: incidence and outcome. J Pediatr Orthop 2002;22:27-30. 11. Bhat BV, Kumar A, Oumachigui A. Bone injuries during delivery. Indian J Pediatr 1994;61:401-5. 12. Eherenfest H. 1922. Birth Injuries of the Child. New York: Appleton-Century-Crofts. 13. Straub Hl, Chohan L, Kilpatrick CC. Cervical and prolapsed submucosal leiomyomas complicating pregnancy. Obstet Gynecol Surv 2010;65:583-90. 14. Zaima A, Ash A; Fibroid in pregnancy: characteristics, complications and management. Postgrad Med J 2001;87:819-28. 15. Tchente Nguefack C, Fogaing AD, Tejokem MC, et al. Évolution de la grossesse sur un utérus fibromyomateux chez un groupe de femmes camerounaises. J Gynecol Obstet Biol Reprod (Paris) 2009;38:493-9. Epub 2009 Jul 2.